From fire (damage to an I-17 guardrail pictured above) to ice (the ADOT TowPlow), our photographers have seen – and snapped pictures of – it all. They’ve gone thousands of feet into the air to provide us with aerial photos of the US 89 landslide and into a sinkhole on US 89A near Sedona to get us close to the action. ADOT photographers are often right next to engineers while they're assessing a problem or taking photos over the shoulder of a construction worker as a bridge deck is poured. 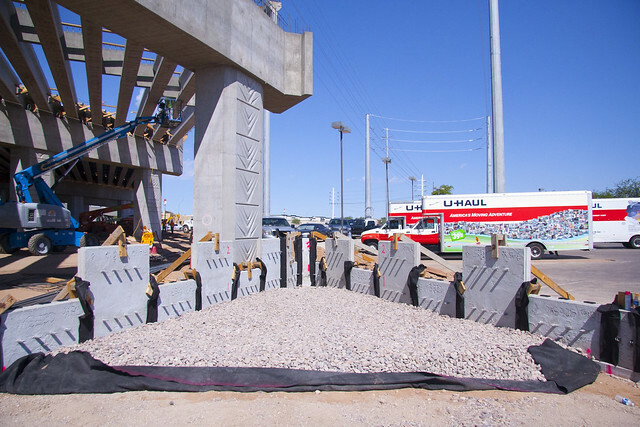 Over the past few months, crews have closely documented the US 60 (Grand Avenue) and Bell Interchange project. Below are the latest photos from the project, showing the deck pour on the new Bell Road overpass and work on mechanically stabilized earth walls. If you’ve missed any of the 5,000 photos they’ve uploaded to Flickr over the past five years, follow the ADOT Flickr page. We know many of you have been watching their work because the page has had more than 2 million views!